Tokyo summers are terribly hot and horribly humid. We seek refuge in kakigōri, shave ice, topped with toppings sweetened condensed milk, mattcha, azuki beans, and fruit preserves. The only problem with going out for kakigōri is that this time of year there are usually long lines, often outdoors. We beat the heat at home with a kakigōri machine so we can have shave ice any time. Look for kakigōri machines at electronic shops like Bic Camera or Yodobashi Camera. This machine came with two plastic cups for freezing water for ice. The recipe book also suggests freezing milk with sweetened condensed milk and strawberry jam that is then shaved. We have been fun playing around with the variations. My favorite so far is this rhubarb jam and sweetened condensed milk. If you are visiting Japan, look for small flags with this kanji 氷 (kakigōri) in front of their shops. Tokyo has just gone through the longest heat wave on history, eight days of temperatures over 35 degrees. 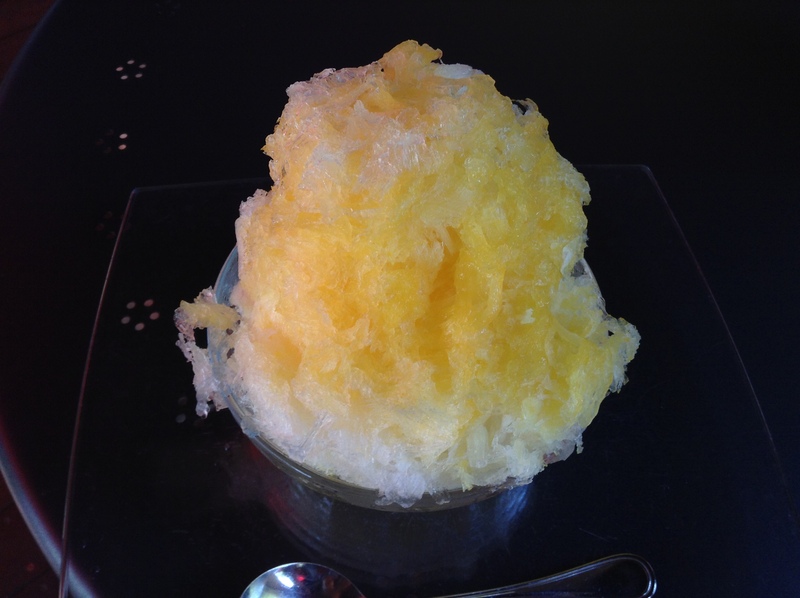 One way to cool down in Japanese summers is with shaved ice, kakigōri. Look for the simple kanji sign 氷, usually written in a bright red kanji on a square blue and white flag. We live out on the Chūo line and did not have the energy to head into the city. Cafe Cula in Koganei uses tennen (natural) ice. It is very delicate and melts quickly so you have to dig in. The sweet sauces are all made from scratch. I went with passionfruit and the tart and aromatic fruit was just what I needed. I am spoiled to have had such nice ice and am afraid others will be disappointing after this one. Cafe Cula only has a handful of seats inside and the rest of the seating is outdoors under shade. It is open from 2-5 p.m. from mid-July to the end of August.